Ratatouille makes eating your vegetables a pleasure. This popular and healthy Provençal classic shows how vegetables can be colorful and alluring: Who can resist a dish of ratatouille (pronounced rah-tah-TWEE)? The tomatoes are bursting with natural umami flavor. 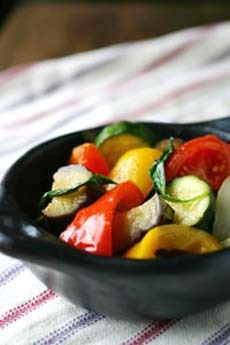 Because ratatouille can be enjoyed cold as well as hot, it is a perfect dish for a summer garden party or a picnic. Cut the vegetables into fairly large bite-sized chunks. Crush the garlic with the flat blade of a knife. Heat the olive oil in a deep saucepan and add the crushed garlic, chiles, bay leaves and chopped vegetables. Stir, and when everything has been coated in oil, put the lid on and leave to cook, stirring occasionally, until the eggplant has softened. Add the salt, pepper and basil or parsley. If there seems to be too much liquid in the pan, decant it to another pan and boil to reduce it before returning it to the vegetables. Arrange the ratatouille on plates, and add salt to taste. Recipe and photo © UMAMI Information Center. All rights reserved. All other material Lifestyle Direct, Inc. All rights reserved.